The global natural ingredient insect repellent market is segmented based on product type, ingredient type, distribution channel, and region. In terms of product type, sprays and aerosols segment acquired the largest market share of approximately 30% in 2017 due to its widespread application across the globe. Moreover, sprays and aerosols are compact and easy to apply as and when necessary. Furthermore, sprays and aerosols are ideal for camping and recreational activities, to prevent mosquito-borne and other insect related diseases. Geographically, the natural ingredient insect repellent market is bifurcated into North America, Europe, Asia Pacific, Middle East &Africa (MEA), and South America. North America held the majority share of the global natural ingredient repellent market in 2017 both in terms of value and volume. Rising awareness about health benefits of usage of natural insect repellents, changing lifestyle of people, increased R&D in development of effective and efficient insect repellents containing plant based ingredients etc. is fueling the natural ingredient insect repellent market in the region. However, the market in Asia Pacific is anticipated to have the highest growth of CAGR 7.1% during the forecast period. Diseases such as malaria, dengue, and chikungunya are more frequent in this region and are gradually increasing. For example, according to Asia Pacific Leaders Malaria Alliance, malaria is endemic in 19 Asian countries with more than two billion people at risk. Moreover, many Asian and Southeast Asian countries are large producers of oil of lemon eucalyptus which is one of the prominent active ingredients in natural insect repellent. In terms of ingredient type, oil of lemon eucalyptus segment acquired major market share of approximately 37% in 2017 compared to other natural ingredients. Oil of lemon eucalyptus is less volatile compared to other natural active ingredients and hence has better efficiency as it does not evaporates quickly and lasts up to 6 to 7 hours. According to distribution channel, the offline segment still has major market share. Mosquito repellent is a non-grocery, need based item and is preferred to be purchased offline due to its easy availability. However, lack of time, increased awareness among individuals, and wide product availability etc. is anticipated to increase the sale of mosquito repellent from online channels. One of the main challenging factors impacting the growth of the global natural ingredient insect repellent market is its effectiveness in repelling mosquitoes and several other insects. Natural insect repellents containing plant based extracts are highly volatile in nature and evaporate quickly once applied. Thus it proves to be less efficient compared to synthetic ingredients such as DEET. Increasing awareness of natural ingredient insect repellents due to collaboration of key players with governments is an opportunity for the natural ingredient insect repellent market. Governments and NGOs are actively participating to spread awareness amongst the masses due to improper waste management as well as lack of knowledge among the rural population. Additionally, leading companies are joining hands with governments and helping to spread awareness about various mosquito borne diseases and ways to prevent it. Some of the key players in the natural ingredient insect repellent market include Reckitt Benckiser Group PLC, Godrej Consumer Products Ltd., S.C. Johnson & Son, Inc., Spectrum Brands Holdings Inc., Honasa Consumer Pvt Ltd., First Step Digital Pvt Ltd., Quantum, Inc., Dabur International, Enesis Group,and Homes LLC.Etc. Key players adopt numerous strategies to sustain in the market. Product development and acquisition and partnership are some of the main strategies adopted by key players to gain a competitive edge. The natural ingredient insect repellent market report provides analysis for the period 2016–2026, wherein 2018 to 2026 is the forecast period and 2017 is the base year. The report covers all the major driving factors and key trending topics impacting the growth of the natural ingredient insect repellent market over the forecast period. It also highlights the restraints and opportunities expected to influence the market during the aforesaid period. The study provides a comprehensive outlook on the growth of the natural ingredient insect repellent market throughout the forecast period across different geographies, including North America, Europe, Asia Pacific, Middle East & Africa (MEA), and South America. The natural ingredient insect repellent market has been analyzed in (US$ Million) in terms of revenue, in (Million Units) in terms of volume, and the CAGR (%) for the forecast period 2018 to 2026 has been provided. The natural ingredient insect repellent market is a global report studied on the basis of product type, ingredient type, pest targeted, distribution channel, and region. 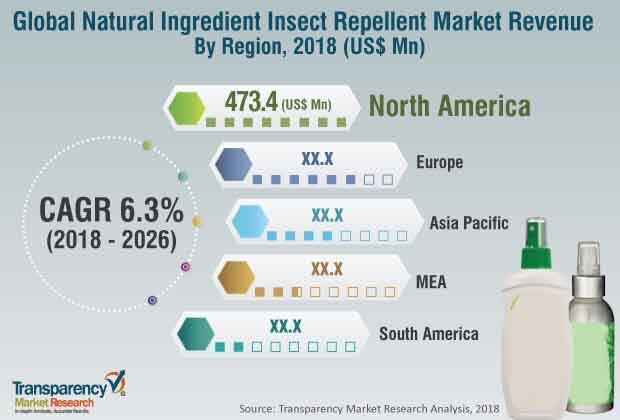 The report also highlights the competitive landscape of the natural ingredient insect repellent market, thereby positioning all the major players according to their geographic presence and recent key developments. The comprehensive natural ingredient insect repellent market estimates are the result of our in-depth secondary research, primary interviews, and in-house expert panel reviews. These market estimates have been analyzed by taking into account the impact of different political, social, economic, technological, and legal factors along with the current market dynamics affecting the growth of the natural ingredient insect repellent market. Besides, competition matrix and market share analysis has been included under the competitive landscape to understand the top players’ contribution in the natural ingredient insect repellent market. Each company is studied on the basis of basic information, financial highlights, revenue highlights of regional contribution, and segment contribution, and product portfolio. Additionally, the company strategy and recent developments if any are also incorporated under each company profile section. Some of the key players in the natural ingredient insect repellent market include Reckitt Benckiser Group PLC, Godrej Consumer Products Ltd., S.C. Johnson & Son, Inc., Spectrum Brands Holdings Inc., Honasa Consumer Pvt Ltd., First Step Digital Pvt Ltd., Quantum, Inc., Dabur International, Enesis Group and Homes LLC. The key players operating in the natural ingredient insect repellent market adopt numerous strategies to sustain in the market. Product development and acquisition and partnership are some of the main strategies adopted by players to gain a competitive edge.